If you want to add a bit of excitement on locking your computer then you may want to try locking it with a bluetooth device. 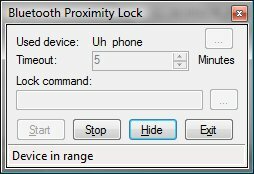 BtProx is a opensource app that can lock your PC when the specified Bluetooth device moves too far away from the PC. The free software makes sure that your PC get locked if you move away from it (as long as you bring your bluetooth device with you). Its definitely a more comfortable and fun way to secure your unattended PC. BtProx is available for Windows Only.